Jenkins guided Cardiff to Challenge Cup success earlier this month. ELLIS JENKINS WILL captain Wales for the first time, with powerhouse wing George North deployed at centre, against South Africa in Washington DC on Saturday. It will be just the fourth occasion in the 73-times capped North’s career he has started in midfield after centre outings for Wales against France four years ago and Australia in 2014 and 2015. Wales coach Warren Gatland had the majority of the Wales players who were involved in the Lions drawn series in New Zealand last year, with Cardiff scrum-half Tomos Williams given a debut. 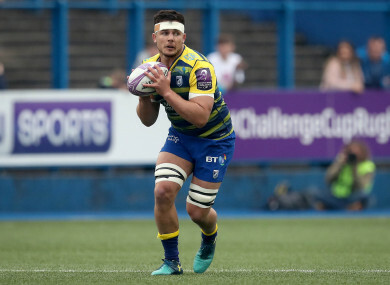 Flank forward Jenkins led the Cardiff Blues to Challenge Cup final success earlier this month, and was named Wales’s tour co-captain with Dragons lock Cory Hill, who starts in the second row. Jenkins will lead the side against the Springboks in the absence of the rested Alun Wyn Jones. “Saturday is a huge opportunity for this squad and for players individually,” said Gatland on Thursday ahead of the one-off Test. “Everything we are doing is geared for the World Cup in 15 months’ time, and the next three matches are a hugely important part of our development. “This weekend is an opportunity for players to build on their Test rugby experience and lay a marker down for the jersey and for the position going forward. Following the South Africa game, Wales travel to Argentina for two Tests against the Pumas on 9 June and 16 June. Email “Jenkins to captain Gatland's Wales as North moves to centre against Springboks”. Feedback on “Jenkins to captain Gatland's Wales as North moves to centre against Springboks”.